When I'm faced with a very high-contrast situation, I know that my camera may not have enough dynamic range to capture an image that looks like the real scene. In that case, I may shoot two exposures and use masking in Photoshop to combine them. This uses Larry Carter's "erasing technique" seen in Simple Two-Layer masking (thank you, Larry). 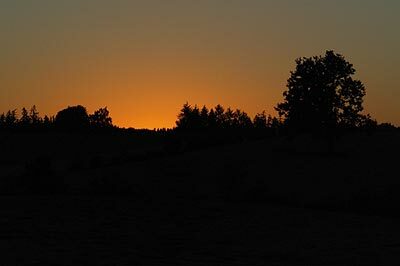 I wanted to shoot a "just-before-sunrise" shot, which I knew would have huge dynamic range. I wanted to achieve a photo that would look like reality, and I knew that I couldn't accomplish that with a "straight from the camera" shot. To handle the contrast, I shot two exposures: one for the bright sky, and another for the darker field, and used masking to combine them. By the way, you need a sturdy tripod to make sure the camera doesn't move between the exposures. These are instructions for the process I used, but there are many other methods that would work. Also, these instructions are written for the PC, and may require minor variations for the Mac. I'm going to refer to the image exposed for the sky as the Sky image, and the other one as the Field image. Open both images in Photoshop. If they're in 16-bit mode and you are using a version of Photoshop prior to CS, convert them to 8-bit mode (Image/Mode/8 bits/Channel). Click on the Field image and then copy it by doing Control-A and then Control-C.
Click on the Sky image, and paste the Field image over it by doing Control-V. It will be added to your layers window as "Layer 1" (if your layers window isn't visible, go to the menu and click Window and then Layers). At this point, the Sky image will seem to disappear. 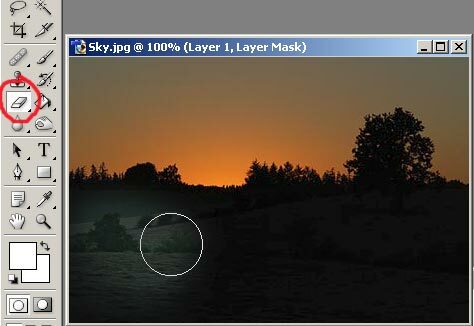 Make sure Layer 1 is selected, and create a mask, using the main menu items Layer/Add Layer Mask/Hide All. Now the Sky image is visible again. In the Layers window, make sure that the Layer Mask Thumbnail of Layer 1 is selected. In the toolbox, click the Eraser tool. Set the mode to Brush or Airbrush, the size to somewhere between 100 and 300, and the Flow or Pressure to about 7%. Make sure the background color is set to white. Now use the eraser tool on the image to "erase" the mask over the field area slowly. As you can see below, the Field image is starting to appear. You control how much of it appears by how much of the mask you erase. If you erase too much, you can set the background color to black, and "unerase" it. I realize that there are those who might consider this to be "cheating," and I respect that opinion, but I really can't agree. I didn't add anything that wasn't in the original exposures, and in fact the final result looks much more like reality than either of the individual images.